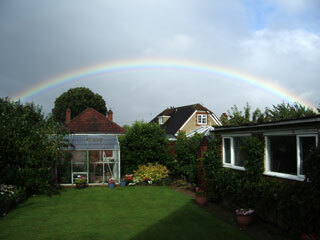 Rainbow seen from St James Road in Radley after the downpour on 20th July. Exceptionally heavy rain falling over much of Southern England and the West Midlands on Friday 20th July caused serious widespread flooding during the past week. Despite the Thames flooding parts of Oxford, Radley and Abingdon downstream escaped the worst effects. On Friday 20th July, over 100mm (4 inches) of rain fell over much of Oxfordshire, Berkshire, Hampshire, Worcestershire, Gloucestershire and parts of neighbouring counties causing widespread flash flooding and travel disruption. Many villages and homes, even if not directly affected, were cut off from their surroundings. Many people found they were unable to return home from work that evening. By the following day, most of the water seemed to have disappeared. Sunshine and a drying breeze soon brought things back to a semblance of normal for many people. However 100mm of rain falling over an area of over 10,000 square kilometers is an incredible amount of water and equates to 1 billion (1,000,000,000) cubic metres or 1 Teralitre (1 Tl = 1,000,000,000,000 litres) of water. It all had to have gone somewhere. It had! By Saturday evening, the minor tributaries of the Thames were in full spate resembling major rivers in their own right and many towns and villages across Oxfordshire suffered severe flooding as a result. In the Cotswolds, the Windrush overflowed its banks and flooded parts of Witney and low-lying areas to the south, around Standlake and Stanton Harcourt. Several villages had to be evacuated. Further south, the Vale villages of Charney Basset, Lyford, Garford and West Hanney, in particular, experienced flooding from the River Ock and its tributaries. In Abingdon, the Ock burst its banks flooding many properties in its vicinity and turning Ock Street into a lake. [pictures] Areas of South Abingdon were particularly badly affected, including Caldecott Road and adjacent areas. It is hardly surprising that, under the pressure of all this water, the Thames was soon filled to bursting point and quickly reclaimed its flood plain. In Oxford, extensive flooding occurred where it had occurred in 2003, causing property damage in Osney, Botley Road and Abingdon Road. Under the spotlight of the world’s media. In Radley, rainfall totals were between 90mm and 100mm but there were no particular immediate problems. Indeed, a wedding reception was held at the Radley Boathouse on Sunday 22nd despite steadily rising river levels.